BarCampPhilly 2008: What a blast ! 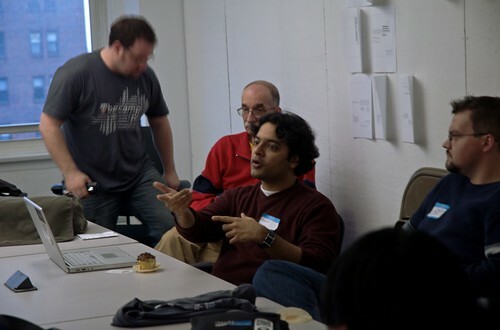 This weekend Philadelphia was host to its first BarCamp event. For the uninitiated, BarCamp is an international network of user generated conferences â€” open, participatory workshop-events, whose content is provided by participants (wikipedia link here). Barcamp is described as an “unconference”, with the sessions being a lot more casual and more like conversations than presentations. Having been to a bunch of conferences before, I definitely found the organic nature of BarCamp rather refreshing. When I walked in at 8:15-ish in the morning, I had no plans of presenting anything but swept by the energy in the group, I ended up giving not one but two sessions (more on that later). Working for Comcast, and pretty familiar with how it is most often a subject of blame than praise, the biggest surprise for me was how positively the attendees spoke of Comcast. For example, a session on ROI on social media was dominated by a discussion on the @comcastcares twitter account run by Frank Eliason from Comcast support. Always available a tweet away, Frank has been answering twitter users when they have Comcast related troubles. The conversation around how Comcast “gets it” was definitely new (kudos @comcastcares 🙂 ). Comcast definitely had a strong showing at Barcamp this year, with a bunch of us attending as well as volunteering for the event. Aaron Held, the director of engineering at Comcast Interactive Media (the division I work for) gave a talk on building Comcast.net, a site that boasts being one of the top 10 portals on the web, to a packed room. Aaron and I also had a round table discussion about innovating within a corportation, and I personally got a lot out of that (I’ll post a blog post on that sometime later this week). Also, continuing my agenda for a Flash-y world, I gave another talk on using Flash in an AJAX world, where I talked about where Flash had certain advantages over AJAX (besides the richer interfaces it enables). Kevin Fitzpatrick, another fellow Flash dev for CIM gave a talk on sharing your ideas early and leveraging the community to take an idea from concept to a product. Livia, another fellow Cimian (yes thats what we call ourselves now 😉 ) from our IA group also gave a talk titled “Jedi Mind Tricks – mediating user, brand, technology & business goals through conversation” which unfortunately I missed as I forgot to check for new sessions on the schedule. Wonder if anyone took notes on that one. After an intense day of a lot of fun sessions, the day ended at the always fantastic National Mechanics bar, which was made even more geek friendly with a hooked up Rock Band and (gasp!) an open bar! It was amazing. Hats off to the BarCamp organizers Roz Duffy and JP Toto and the entire volunteer army. You guys did an amazing job. Here’s to a lot geekier Philadelphia :). Oh and btw, one of the things I had to do was animate a wordle that the BarCamp peeps created. This ran on a couple of big screen displays at the conference. I am attaching it here for posterity and the source can be found here. Nice wrap up of this weekend’s barcamp. Nice photo. I was particularly a fan of the round table discussions as there was plenty of enthusiasm and participation. Previous Previous post: Aha, so I am not crazy! Choose Flash for portable apps. Yahoo says so.